The Dolomites has always been interesting for their limestone peaks that are distinctive and creates a unique terrain in the northeast of Italy near the border between Italy and Austria. 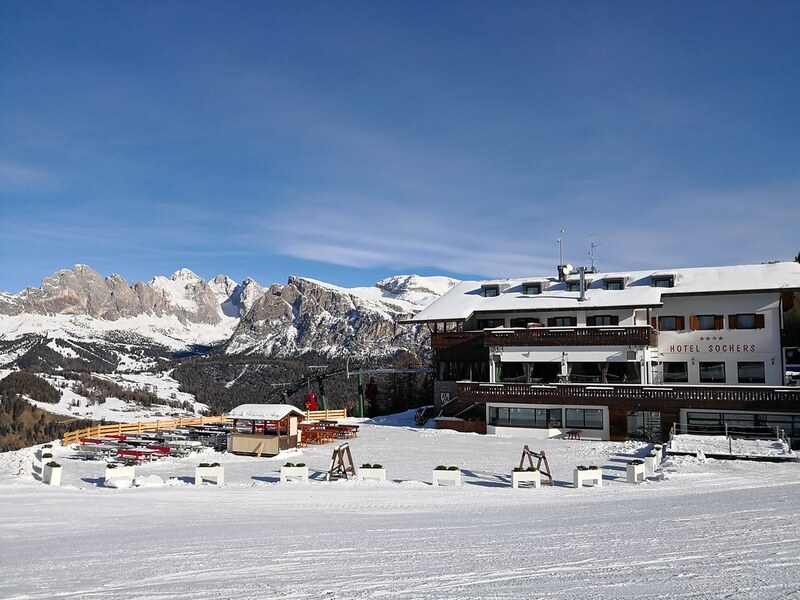 With its natural scenery, the venue is great for skiing in the winter with numerous ski areas around the Sella Ronda, considered one of the top ski touring courses in the Alps. 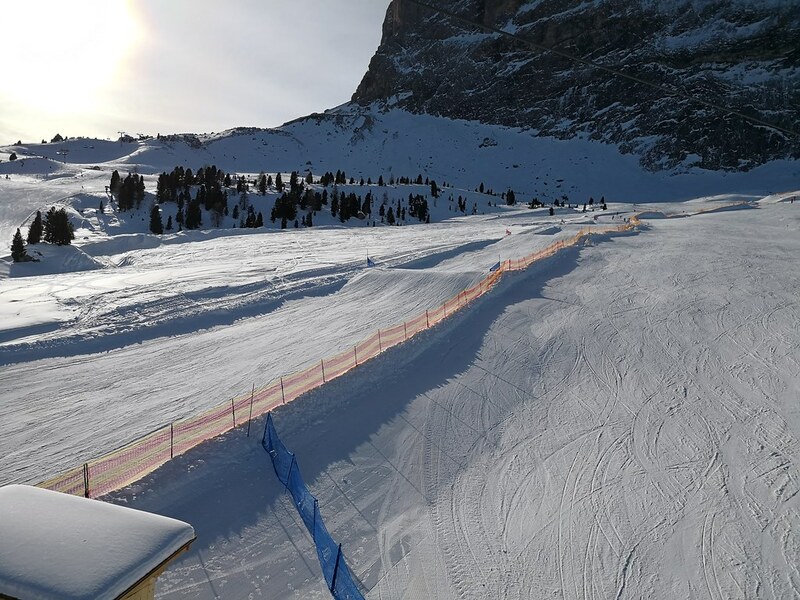 While the most famous ski area in the Dolomites is probably Cortina d’Ampezzo, I chose Val Gardena for my virgin experience skiing in the Dolomites. 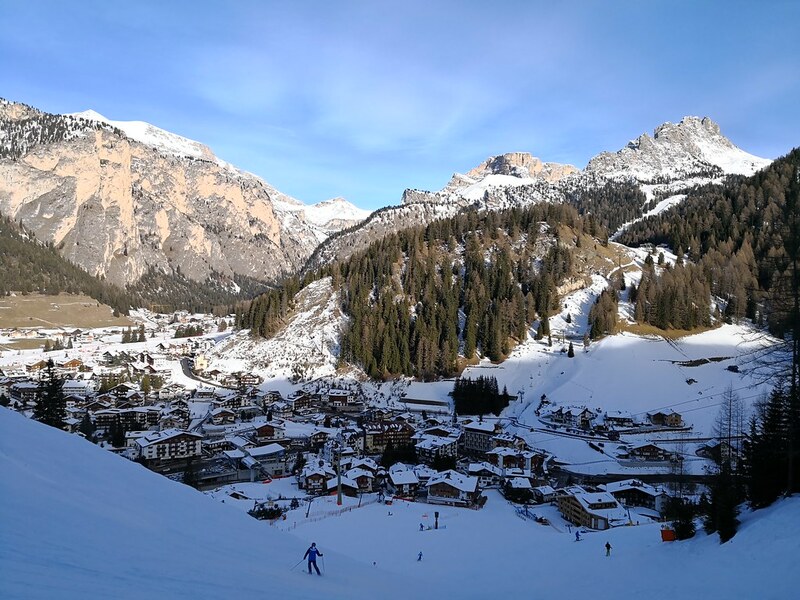 Val Gardena and Alpe di Siusi ski area comprises of 3 main villages stretching from St. Ulrich to St. Christina to Wolkenstein, with St. Ulrich being the first major town from Bolzano. As I was interested in the views for just one day of skiing, I picked Wolkenstein as my base. 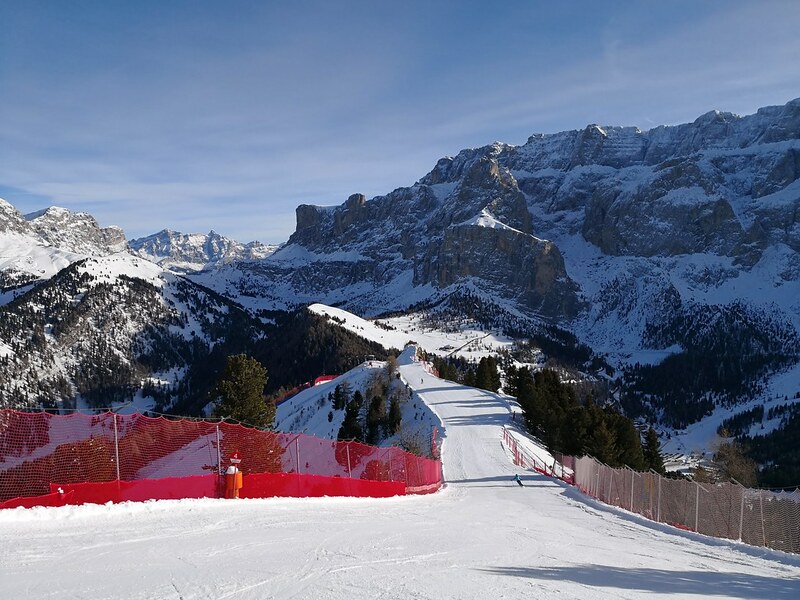 For skiers attempting to ski around the Sella Ronda, Wolkenstein also makes sense being one of the corner starting point for the ski course. There are numerous parking areas in all the main villages with regular shuttle buses running between these villages and the base for gondola and cable cars. It takes about an hour by car from the centre of Bolzano into Wolkenstein with travel time becoming longer by a mix of public buses and trains. Like many European ski resorts, the ski lift infrastructure here is excellent. 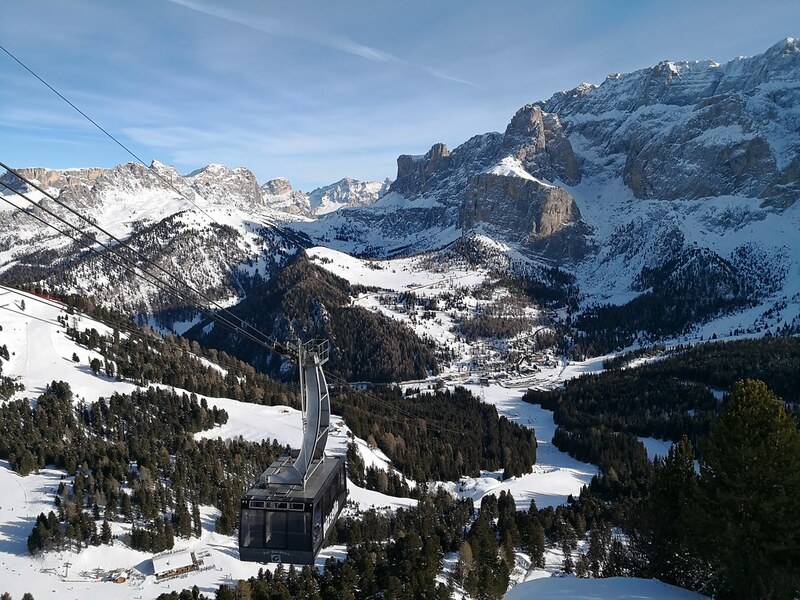 From the cable cars in Saslong and Ciampinoi to the aerial tram that brings skiers to the top of Piz Sella, there is a direct way to the top to get the day started quick for downhill skiing and snowboarding. 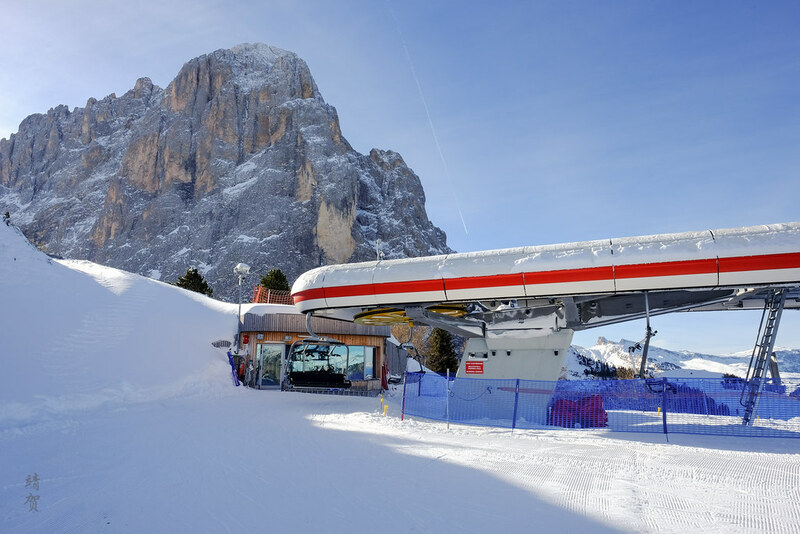 The new Piz Seteur cable cars provides faster access to the Sella Ronda route and that makes Val Gardena and Wolkenstein an attractive starting point for this ski route. High speed six-seater chairlifts are also common here, whisking skiers back up to the summit between Sochers and Ciampinoi and around the Gran Paradiso ski areas below Piz Sella. 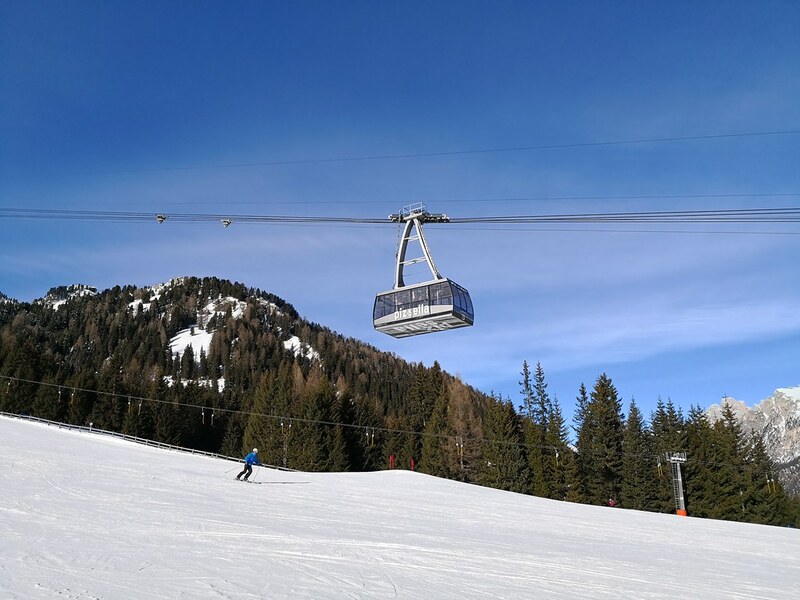 Amongst them, the largest concentration of chairlifts and gondolas in Val Gardena is probably around the Plan de Gralba and the Emilio Comici lodge near the top of Piz Sella. Between Plan de Gralba and the base of Ciampinoi in Wolkenstein, there is a 2-seater chairlift and a short connecting 3-seater chairlift. In addition there is one T-bar at the base in Plan de Gralba and 2 T-bars at the Ciampinoi base. 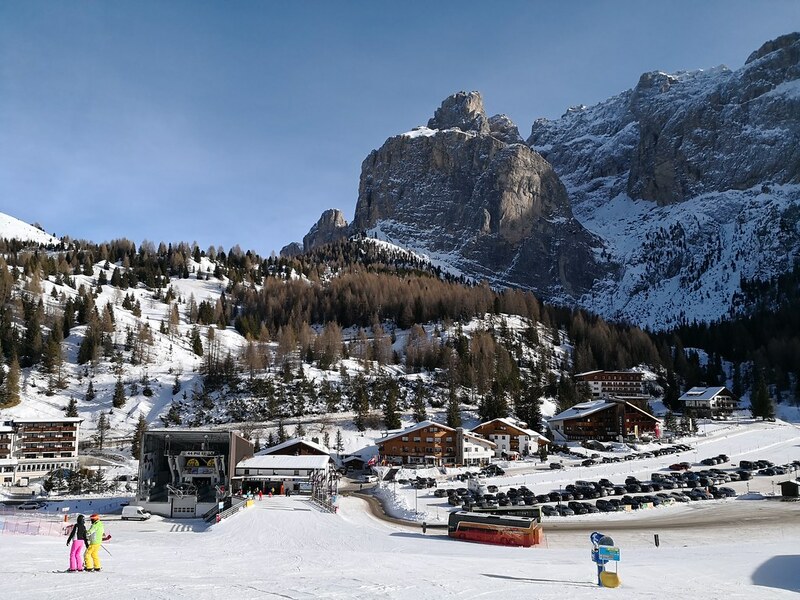 Daily lift tickets just for the Val Gardena/Alpe di Siusi ski areas range from EUR43-54 (~$53-67) depending on early or peak season while prices for the Dolomiti Superski is a few Euros more at between EUR47-59. 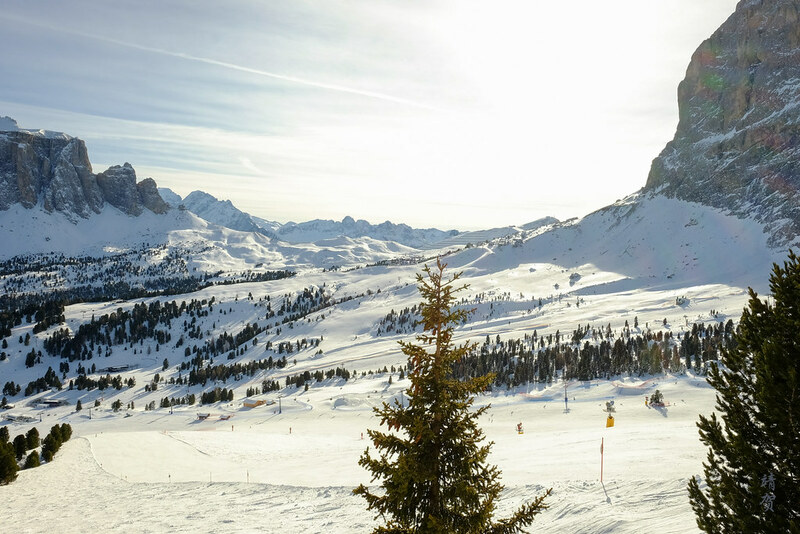 For expert skiers who are planning to do the Sella Ronda or venture to other linked ski areas, it is definitely worth it to purchase the Dolomiti Superski pass. 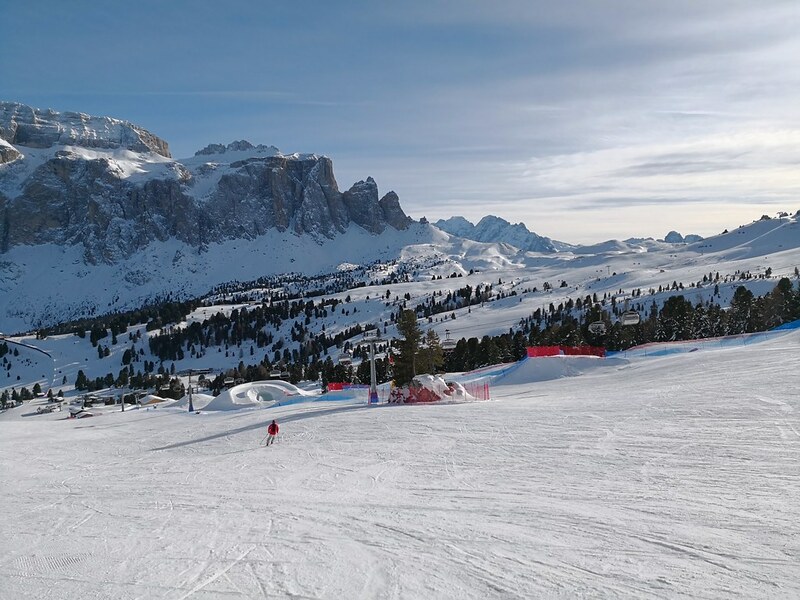 Leisure skiers, on the other hand, would probably just stick with the Val Gardena ski pass as I found it still gave me enough terrain to cover for a full day especially when you take frequent stops to take photos and have lunch! Whichever ski pass one chooses, the views would make it worth it even if the snow quality early in the season before Christmas is usually not optimal. Thus I do recommend coming during the peak ski season when conditions might be better for skiing to get the most out of the resort. Skiers buying passes for several days do get a few Euros off but I do not recommend doing this as savings are limited and conditions can be variable. 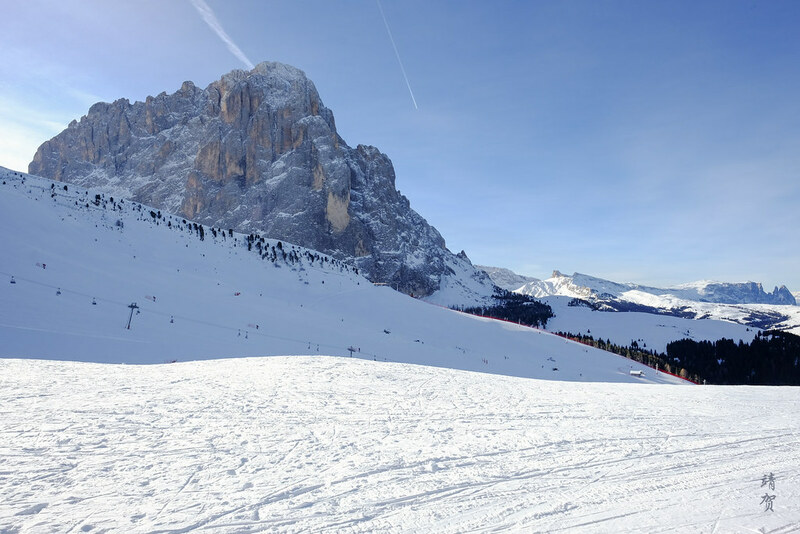 Furthermore skiers can save a few Euros if they are planning to just ski in the Val Gardena area which one would probably do when staying for a week during inclement weather. Skiers new to the sport might find this ski area somewhat unfriendly to them. It is the same for families since there is no dedicated space to learn on this side of Wolkenstein. 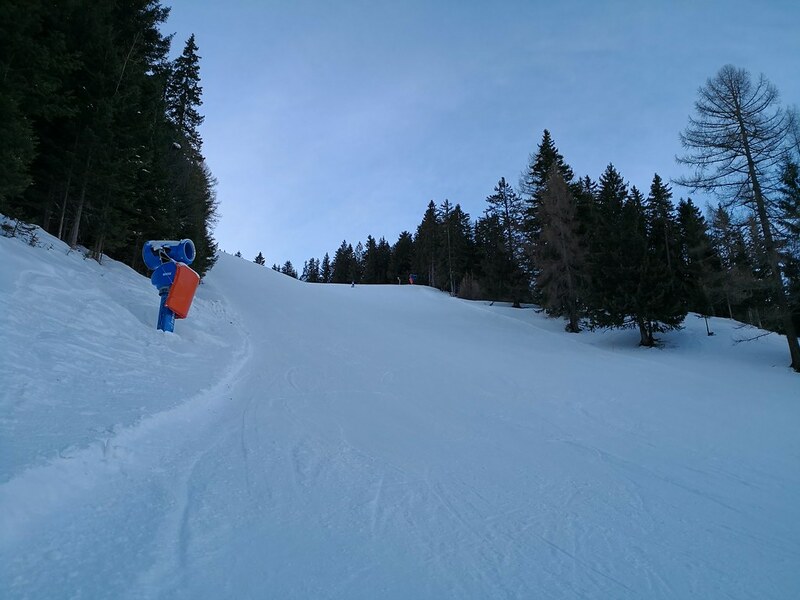 There are plenty of blue runs on the other side of the resort below the cable car to Dantercepies. However as I did not try the piste around Dantercepies, this is not one area I could review. Otherwise there are several blue runs served by T-bars on the base of Plan de Gralba making them another spot worth considering. Plan de Gralba also has more blue runs in the area below Piz Sella. 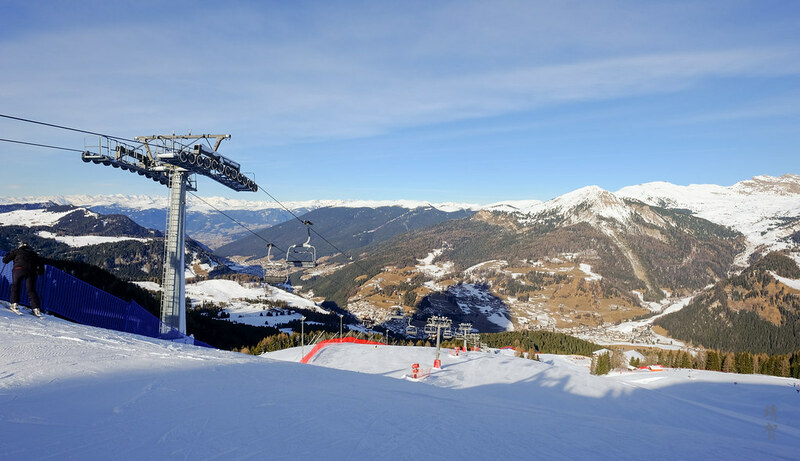 Served by the Comici, Sotsaslong and Gran Paradiso chairlifts, these areas are great for skiers and snowboarders keen to improve their riding. In addition to the gentle slopes around Gran Paradiso, there are specially moulded terrains like a wave course to add to the fun factor. However getting to this area requires traversing through a short and easy red section which can prove to be more challenging to beginners. Otherwise, they should be easy to get to via the Piz Sella for more confident beginners. 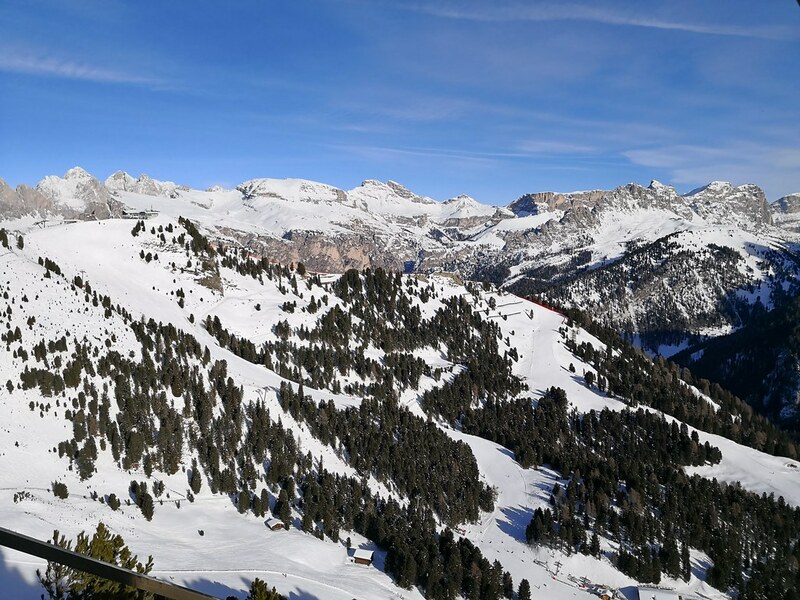 Other areas with blue runs includes the lower 1/3 of the piste from Piz Sella to Plan de Gralba and the area around the Senoner T-Bar. Again it should be stressed that blue runs here are the lowest tier for beginners and I would not really consider this ski resort to be the best for beginners or families with kids planning to take up winter sports. The next tier of pistes here is marked as red and forms nearly 70% of the skiable terrain. However the intermediate red pistes can have some variations. For example the red pistes in the Sochers-Ciampinoi area that is accessed from the Ciampinoi cable car can be steeper and more difficult for skiers who have just progressed. While steep, the pistes around Sochers-Ciampinoi is excellent as it is a wide open bowl, allowing some free-riding in the area. Advanced intermediate skiers and snowboarders would certainly enjoy the speed and thrill here. On the other hand, some of the red piste can also be quite narrow and steep like the one linking Ciampinoi to Plan de Gralba. Some of the red runs leading back to the base can also be quite steep even if they are marked as red pistes. Add in the shade from the trees and the crowds in the evening, and they can pose a problem for some skiers who are not that confident yet on their last run down. Personally, I felt the resort could certainly label the piste more precisely by adding a green run and instead make some of the red pistes as blue. Some of the red piste like the one underneath the Piz Sella can be nice as they are wide open but some can be steep, icy and crowded. Much of the expert marked piste here can be attributed mainly to how steep they are. From the top of Ciampinoi, there are black runs on the bowls into Hotel Sochers and the ski lodges theres. There is even a black run from Ciampinoi back to the base. Another black-marked piste is the gladed runs nearby the trees from the top of Piz Sella, ending somewhere near the bottom of the run near Plan de Gralba. In addition, some of the intermediate red-marked pistes can be classified as a black run in some ski resorts. 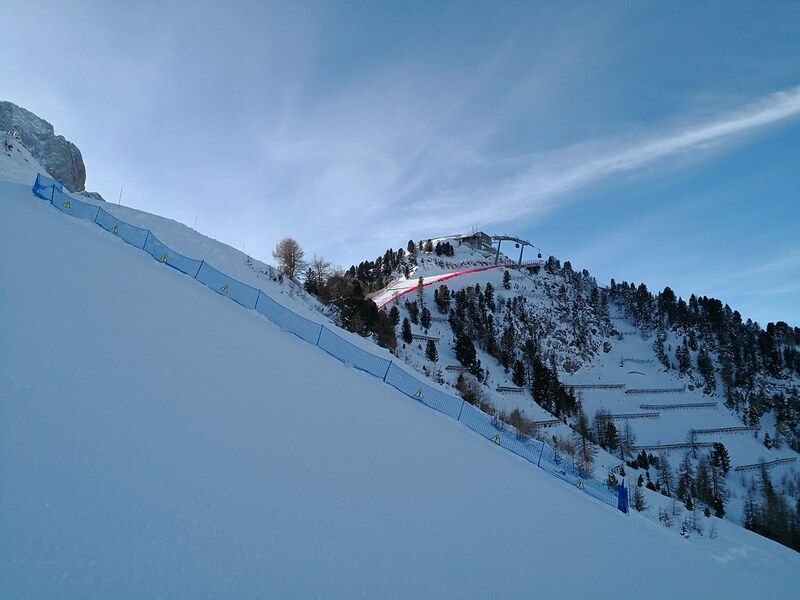 As such I would classify those steeper red runs as black in this context. 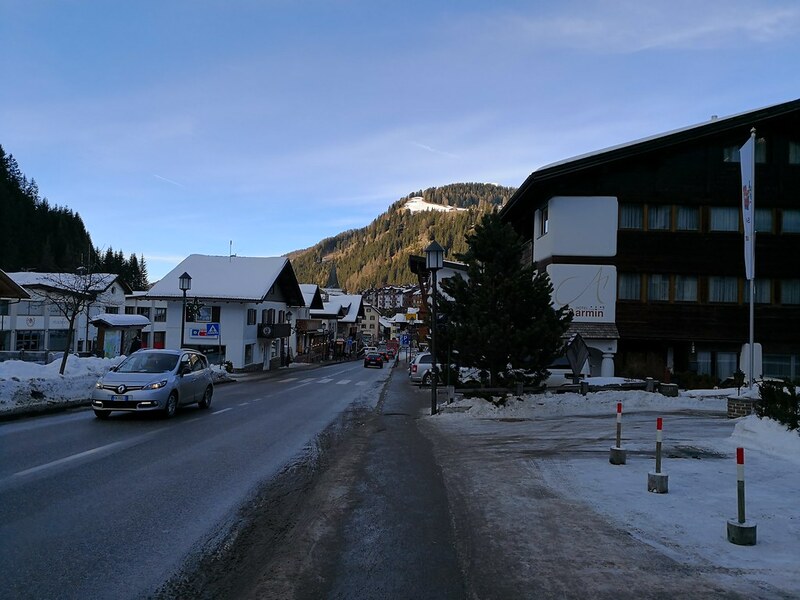 This includes the final approach to the village of Wolkenstein which can be a bit tricky for some intermediate skiers and snowboarders as it can be a bit steep. With half of the pistes in Val Gardena covered with trees, there are certainly some fun terrain off the marked pistes for expert skiers. Around the peak of Ciampinoi and Piza Pranseies chairlift, there are some off-piste areas with sparse trees that makes for a great tree run for intermediate skiers who want to try out some beginner backcountry stuff. Otherwise I do not recall noticing any backcountry gates since much of the areas can be skied here though the snow cover can be somewhat spotty early in the season. It should be noted that the highlight here for advanced skiers would be the ski route around the Sella Ronda. As a nod to the rise of snowboarding in Europe, there are terrain parks here on the gentle slopes below the Comici chairlift. This is even marked as a spot for snowboarders in the piste map. While not large by any means for a ski resort of this size, it does have that facility available which makes it great for use in the spring time or early in the season. There are plenty of lodges on the mountains in Val Gardena, similar to other resorts in the Alps. 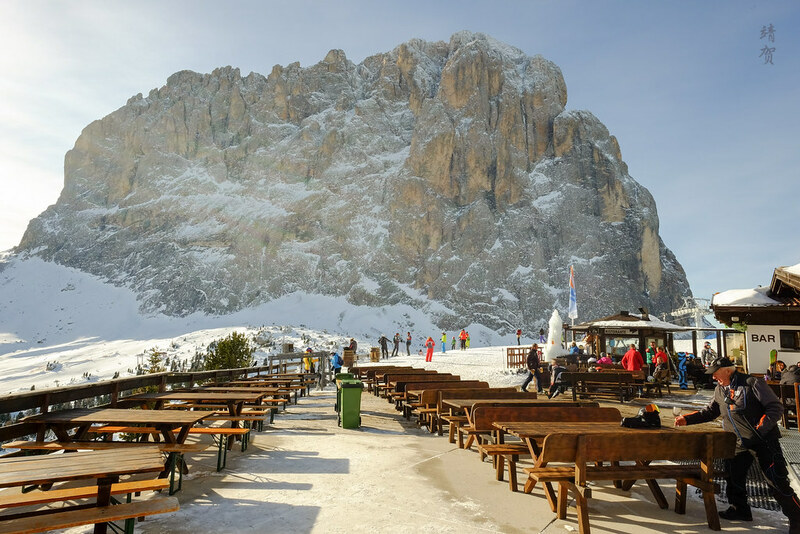 Both peaks at Piz Sella and Ciampinoi have venues to sit down for refreshments though the patio on Piz Sella is open-air while the ski lodge in Ciampinoi is complete with lavatories, places to sit down for a meal and a cozy space to escape from the cold. 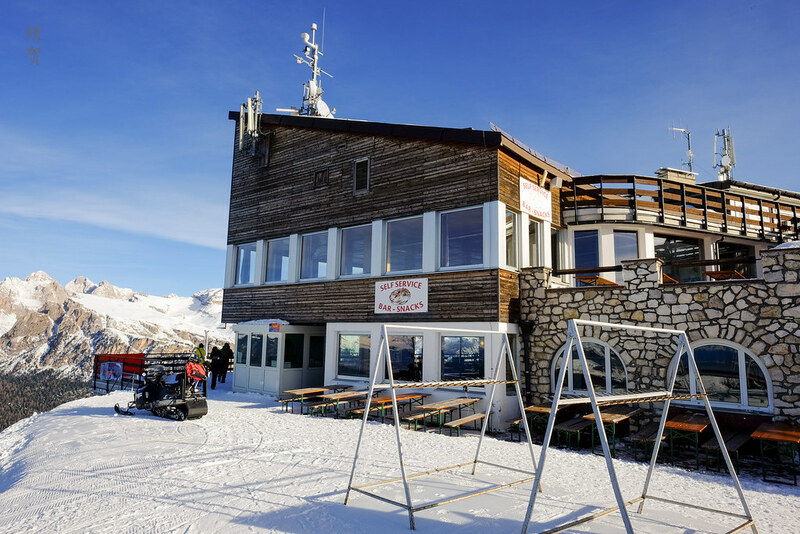 Other huts found on the mountains include the Rifugio Emilio Comici a short distance from the Piz Sella and at the top of the Comici chairlift. There are also ski huts in the Sochers area with the Hotel Sochers located there along with the Saslonch Hutte. Many of these ski huts and lodges sell refreshments with space to sit down for lunch. The location of these lodges are usually midway between the peak and the base, making them optimal for a rest point as well. 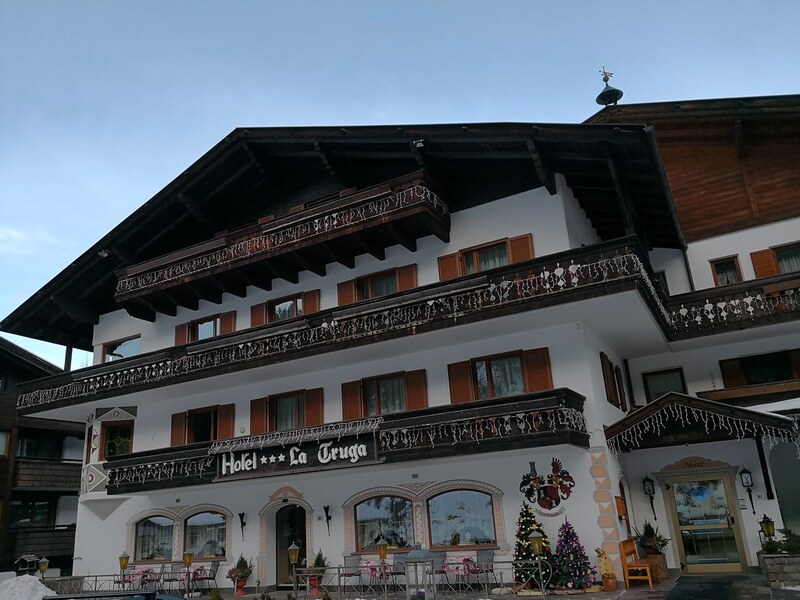 The Vallongia lodge and Saslonch Hutte are just 2 venues located along the ski routes from the top to the base of the mountain. 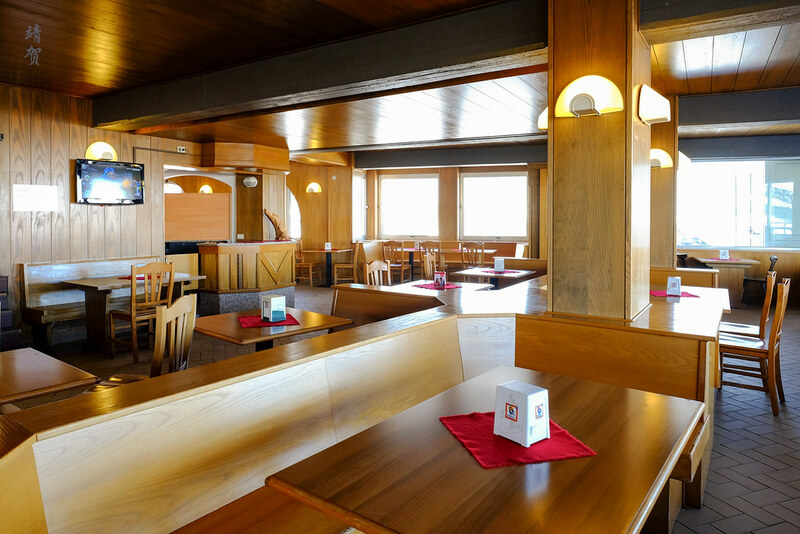 Such lodges make it convenient for skiers to traverse from one ski area to another in the Dolomiti Superski area. The Dolomites, being located in the north of Italy shares much of its cuisine with neighbouring Austria. Thus skiers can find traditional South Tyrol cuisine like Speck here in addition to Strudel served on the ski lodges. Prices are generally on par with other large ski resorts in the area with the premium not that large compared with food served in town. As I did not spend much time here, I cannot really comment on the taste of the food though the facilities to dine in the lodges are clean. With plenty of venues to dine and little crowds early in the winter season, I found it easy to get a seat during lunch time as well. 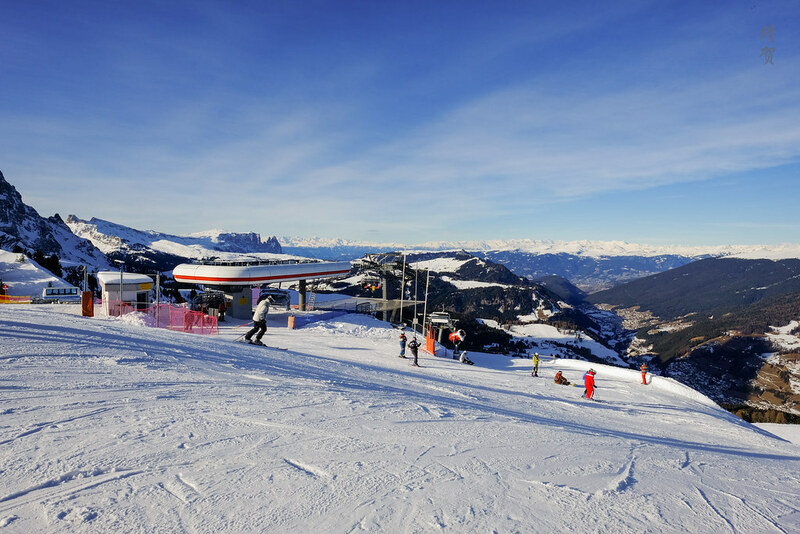 Accommodations in Val Gardena includes hotels in the mid-mountain such as Hotel Sochers located along the slopes. Back down in the valley, the village of St. Christina and Wolkenstein are the larger villages which would be desirable for skiers. Ski buses runs regularly along the main road to bring skiers to the base of the cable cars and chairlifts though I noticed not many of the lodges tend to be ski-in/ski-out here even in the villages due to the small area of the base. Furthermore, some skiers tend to download from the cable cars or gondolas at the end of the skiing day. 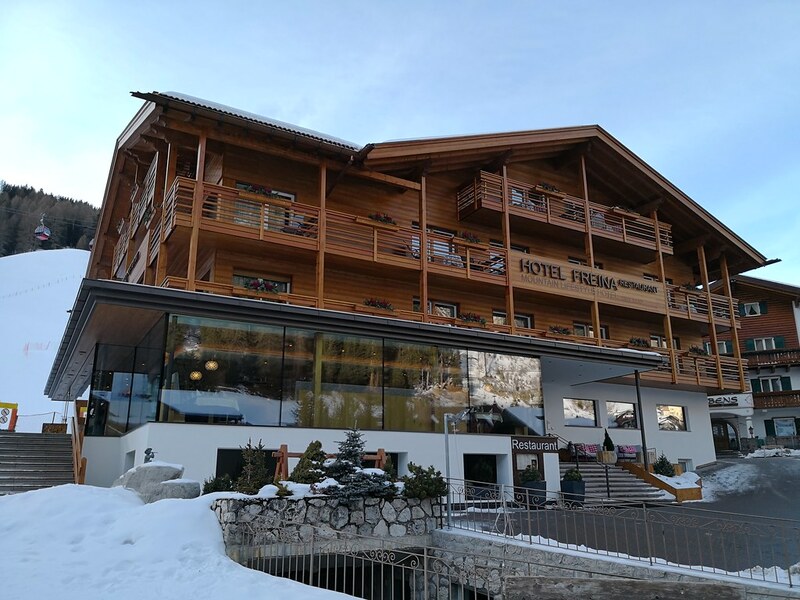 In the villages, the accommodations look like traditional alpine huts with classic Tyrolean architecture, making them charming places to stay for the night! Hotels in the villages does tend to have ski packages for the week as well with half board included. This makes it more difficult for leisure travellers to book accommodation in these villages for shorter stays. 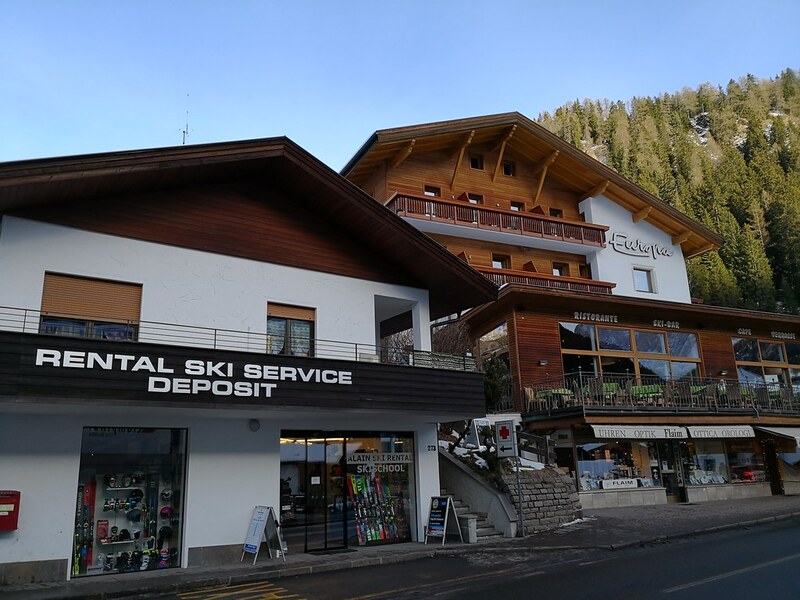 In this instance, skiers would probably need to find one of the more modern alpine lodges or stay in the nearby towns outside of the valley and take the bus or drive into the ski resort daily. 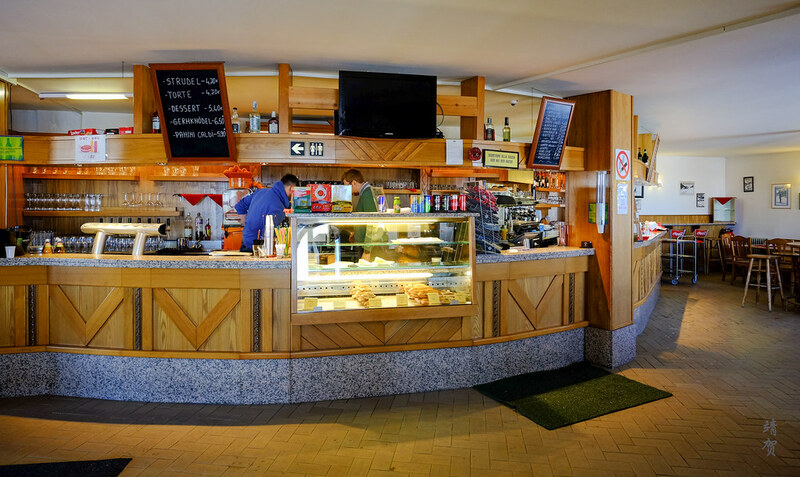 To enjoy a drink or 2 after a day of skiing, there is no better place than at the top of Piz Sella and maybe take the gondola back to town after you are done. When the sun is out, the music and views from here would certainly make a lasting memory of a great day of skiing. Otherwise there are bars and restaurants at the base along with several shops to occupy shopaholics and the party types. However the atmosphere in the village is somewhat staid at best and less raucous than aprés scenes in Austria just north of the border! 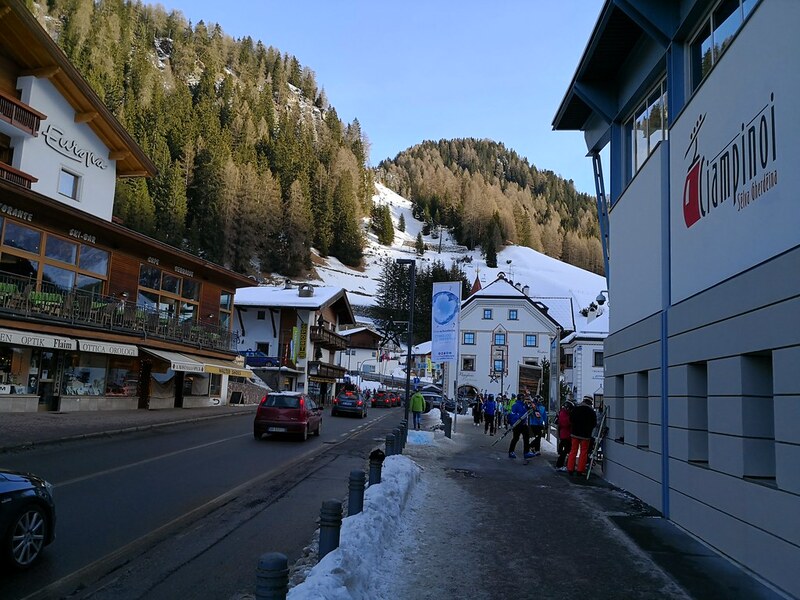 As for activities aside from skiing, the charming villages along with the natural mountain formations create an easy distraction on a beautiful day. 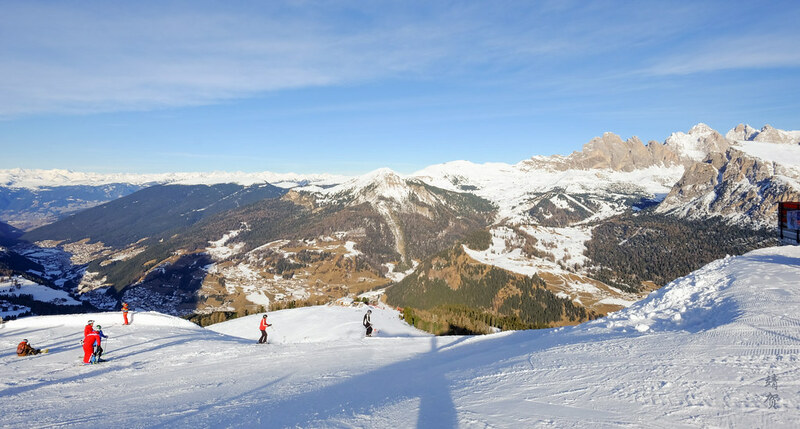 With views being the highlight of every ski trip in the Dolomites, it is recommended that skiers plan a stay comprising of 2-3 days, with one week being optimal to soak in the major sights. Even from the top of Ciampinoi and the top of Piz Sella, the views can be very different. 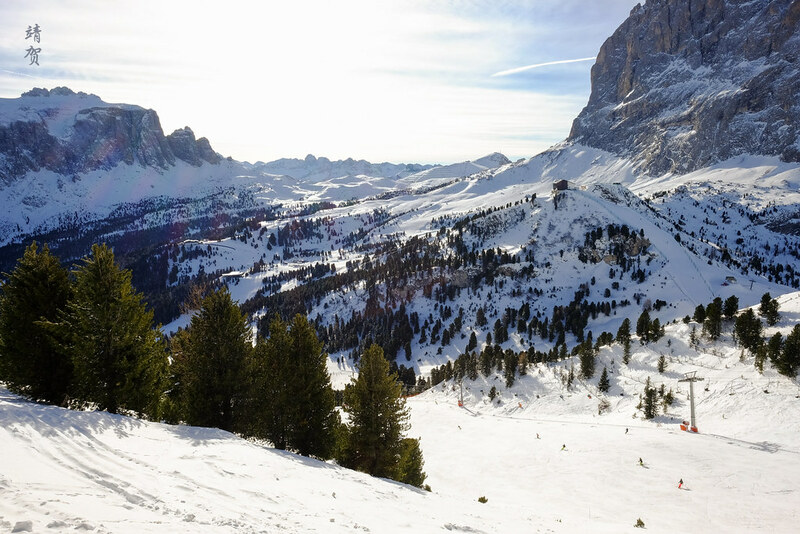 While the Ciampinoi provides average views like any other ski resorts, the ones from the top of Piz Sella should definitely be a highlight of visiting Val Gardena. 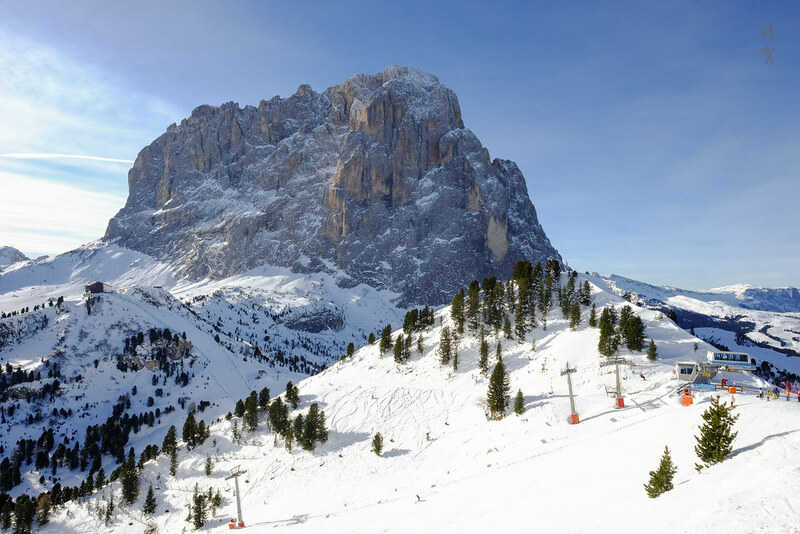 With the Saslonch looming over the top of Piz Sella, skiers get a view of the Sella Ronda, the single monolith with ski areas circling it. Visiting early in the season, the snow was not great. Though with a slightly lower elevation compared to other ski resorts in the Alps, the snow fall here would not win any awards. While the lift infrastructure does strive to bring skiers higher up, do not expect plenty of soft powder here. Because that is not the only reason to ski here, as this resort caters to adventurous skiers who enjoys touring the mountains! 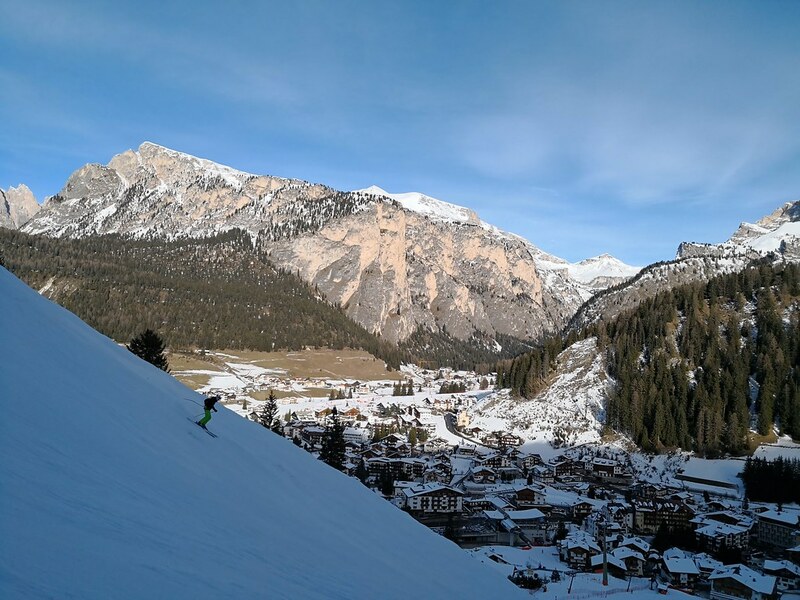 With neat villages around and magnificent mountain views, Val Gardena offers a way to enjoy winter aside from just skiing and snowboarding. But if you value the skiing more, there is always the ski tour route around the Sella Ronda to find out if you are as good as you think!